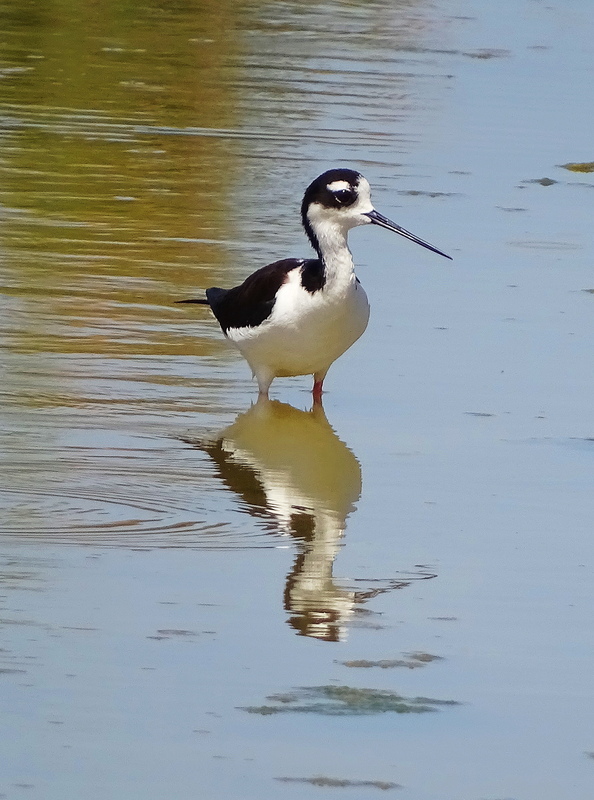 Black Necked Stilts (BNS) are found from California to as far east as Florida, and as far south as Central America and the Galapagos. 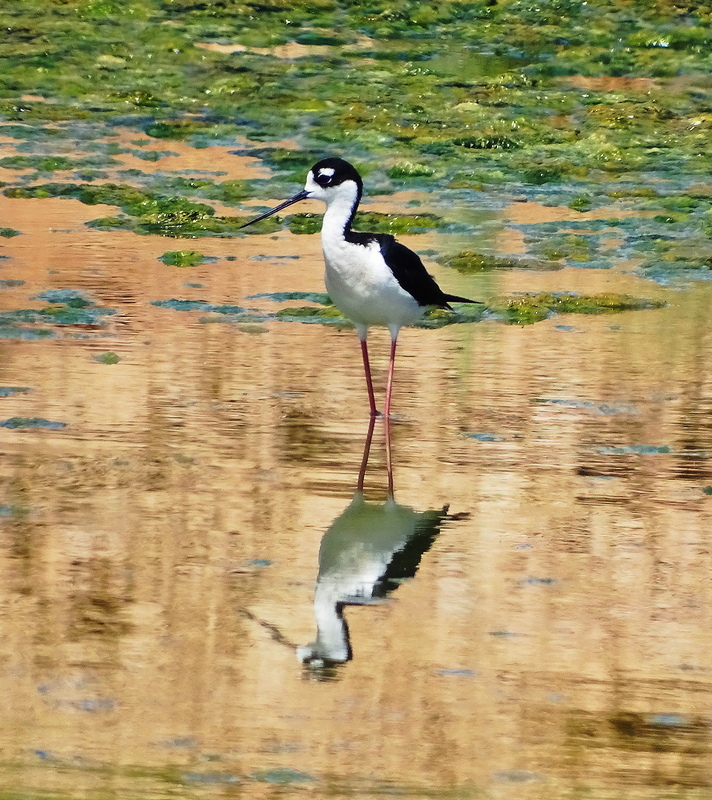 They are waders and have the second longest leg to body proportions of any bird in the world excepting the flamingo (Cornell Lab of Ornithology). These birds were photographed in The Salton Sea in Southern California. The Salton Sea is the largest lake in California. It rests directly above The San Andreas Fault, and lies 71.9 meters below sea level. The Salton Sea is under serious threat, is shrinking, and is heavily polluted. The sea is considered the second most diverse and significant habitat for migrating birds in the US. 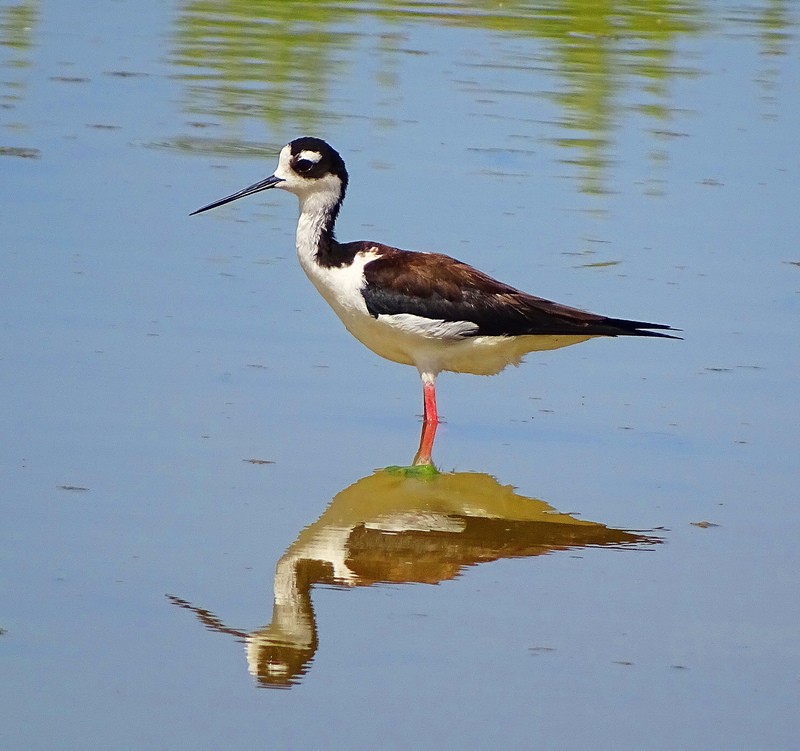 Over 400 species have been identified here, and it is a critical migratory winter resting stop on The Pacific Flyway. BNS populations are in decline due to habitat destruction and wetland pollution. If the sea were to dry up, the millions of birds who rely on it during their annual migration would be imperiled. It would become a giant toxic dust-bowl threatening the public health of millions of Californians. The shrinking of the sea is already emitting toxic dust and chemicals harming human health. Effective plans do exist to save and refresh the sea, but no plans exist to date, to implement them. (For more on The Sea read: http://www.latimes.com/science/la-me-salton-sea-20151001-story.html). 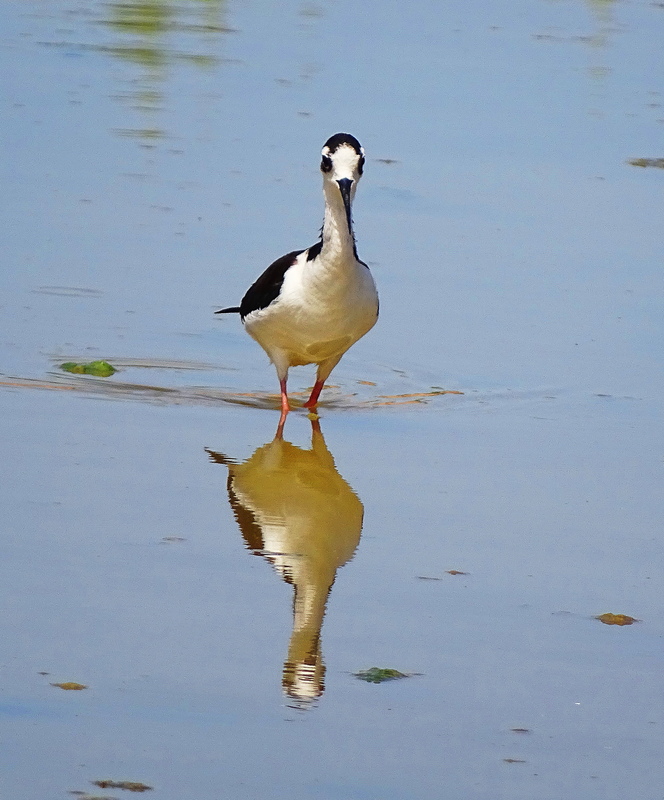 We love these birds – great captures! Aren’t they delicate, wonderful creatures! I also got a baby great blue heron! So cute…. The first pair we ever saw lived near our place north of San Francisco. We named them Fred and Ginger because of the black and white. Those are perfect names. Once you name a wild animal (or two) you are clearly in love. They would be a significant hazard in stilettos though! LOL yes they would! But boy we’d look good, ha! It would make for great photo optics! Wow amazing photos..love the reflections so AMAZING Cindy! It sure did, what beautiful shots! Wow! Those legs were taller than I expected them to be! Yes, they are like ducks out of water, with much longer legs! what a interesting looking bird! We defiantly don’t have any of these guys up our way! They should fly up. Vancouver Island is not a polluted disgrace. Beautiful photos of a special place. 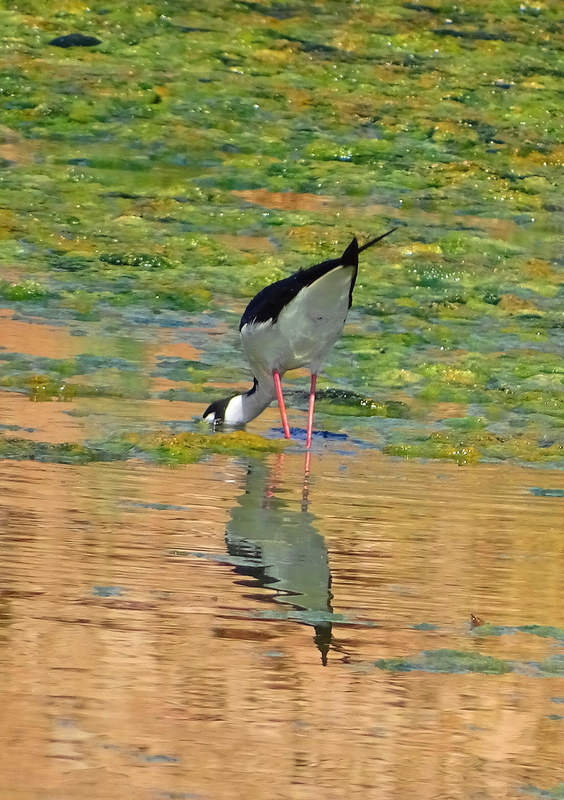 Lovely colours and the Stilts are well named. It constantly amazes me that The Salton Sea can host such a diversity of wildlife and have such beauty whilst being so terribly poisonous and polluted. Love the mirror images ! Stunning! 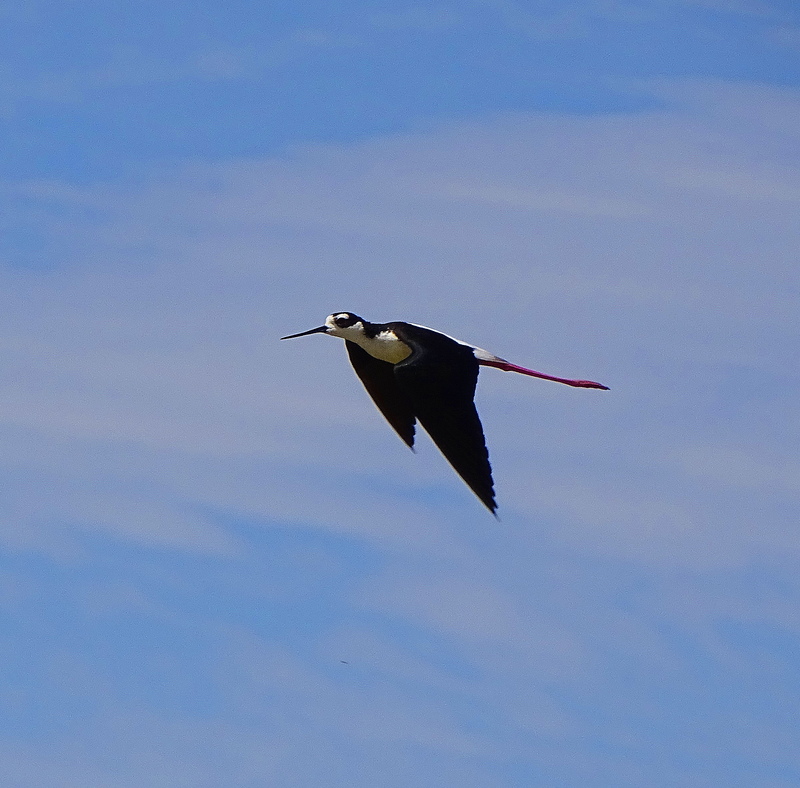 Those long red legs are something else, particularly in flight. They streamline in flight don’t they, like rudders! Something else interfered with by humans. Shame on us! Exactly. The Salton Sea is a case study in human harm and destruction, and yet the birds still come, and are so beautiful. I was born and raised on the southern tip of the Salton Sea in the Imperial Valley. My Dad worked for the water district, and our family owned a 160-acre farm where we grew alfalfa for cattle feed. Two-thirds of the nation’s winter vegetables are grown in the Valley. The Salton Sea is dependent on agricultural runoff that flows through the Alamo and New River. The New River is the most polluted waterway of its kind in the United States. The river begins in Mexico and flows across the border heavily polluted with industrial waste, untreated sewage, chemical contaminants such as mercury and uranium, and pathogens including tuberculosis, encephalitis, polio, cholera, hepatitis and typhoid. Homeland Security has posted bio-hazard signs along the banks of the river on the U.S. side of the border. The agricultural runoff leaches salt from the fertile soil which is then deposited in the Sea. The salinity level — which is higher than the Pacific Ocean — is killing off mass populations of birds and fish. The Sea depends on the runoff to maintain its elevation, but the salt deposits are hastening an environmental catastrophe. To compound matters, the Imperial Valley water district agreed to transfer water to drought-stricken San Diego County. The agreement required that about ten percent of the Valley’s farmland lie fallow. This has contributed to higher food prices while severely restricting the amount of runoff flowing into the Sea. The receding sea level increases the concentration of salt and threatens to transform the basin into a dead body of water. I knew about the inflow from the other direction, from the central valley and the pesticide and fertilizer poisoning, but I didn’t know about the inflow from Mexico and the bacterial and viral pathogens, although it is very clear that the Salton Sea is a bacterial as well as chemically noxious brew. I appreciate your enlightenment, albeit find it quite disturbing. As I am sure you know, we also get this sewage laden bacteria in the ocean areas of Pt Loma, Imperial Beach and Coronado Island, from Mexican sewage outflow. Beaches in these towns are routinely contaminated and often closed. People get sick from swimming even when the beaches are open. The toileting into the ocean from Mexico has always been appalling. Now I can just add The Salton Sea to the equation. You well know that the salinity level in The Salton Sea is ever increasing as the sea evaporates. I have walked the shores for decades crunching on the bones of fish and birds. The selling of water to San Diego is just obnoxious. One thing that puzzles me which you may know the answer to, is where do Palm Springs, La Quinta, Palm Desert and Rancho Mirage get the water to maintain their over-the-top luxurious, tropical city wide, water-hungry landscaping. You leave these lush artificial cities and arrive in Borrego to see the desert in all it’s natural, stark, austere beauty. I know they use recycled water, but we don’t have enough water to recycle do we? And why don’t we send it to the places that are dying of thirst? Your comments and experience are so compelling. I have been fascinated by the sea since I was a little kid. I could never understand how birds and fish could survive there. My son is trained as a wildlife biologist and recently explained to me that toxins accumulate more in living creatures the higher you move up the food chain. A mouse has a shorter life than a human for example, and thus less time to accumulate toxins and acquire disease from them. It boggles my mind that some people don’t connect the poisoning of our environment with our own disease and premature death. It just simply staggers me to see the millions of birds that winter on the sea. It is like this biological wonderland, in a post-apocalyptic, toxic moonscape. To me, The Salton Sea is a contained case study of how we are poisoning ourselves and the creatures around us. It will be sad, and probably pretty horrific, to watch the demise of the sea. As we drove away from the area last week, a major dust storm hit, blinding us in the car. I thought of the children in nearby schools running into the nurses office and asking for their inhalers and eyewash. We are such a dumb species. Thank you so much for sharing your experience. It is very moving to me and very sad. Regarding the dust storm, the Imperial Valley has the highest rate of emergency room visits for asthmatic children in California. I also contracted asthma growing up in the dusty, agricultural environment. 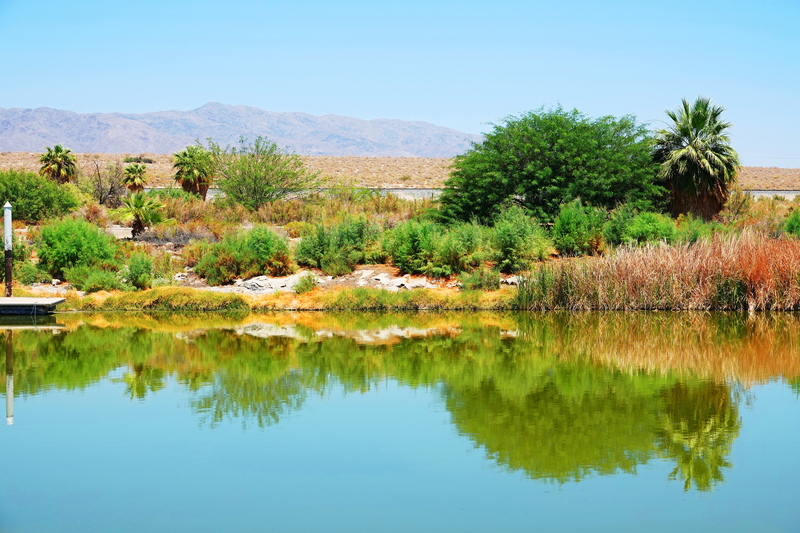 With regards to the lush landscaping in Palm Springs, I only know that the Coachella Valley Water District and Desert Water Agency are still enforcing water restrictions in the communities north of the Salton Sea. The Imperial Irrigation District, which manages water usage south of the Sea, continues to enforce conservation and levy fines for commercial and residential violations. When I was a kid, the Salton Sea was known as Palm Springs South. It was an oasis — a literal Garden of Eden. We are both native SoCal’ers. Some of my fondest childhood memories were tearing around Borrego, which oh so thankfully hasn’t changed. The northern desert cities are like Riverside County congestion now, with better landscaping. I was going to ask about your health but thought it presumptuous. Words fail don’t they. I love the desert so. It is such a beautiful, slowly-revealing place. I am so sorry this has happened, and is still happening. Be well, and it is wonderful to meet you. I enjoyed exploring the Anza-Borrego stagecoach stations. Have you visited Slab City and Salvation Mountain on the south side of the Salton Sea? Or the volcanic mudpots? The surrounding area is a massive reservoir of geothermal energy. It is one of the Valley’s richest natural resources. We took frequent day trips along Highway S-2, but never visited Ghost Mountain. There is so much hidden in the desert. In a lifetime we will never see it all. Beautiful pictures, Cindy. 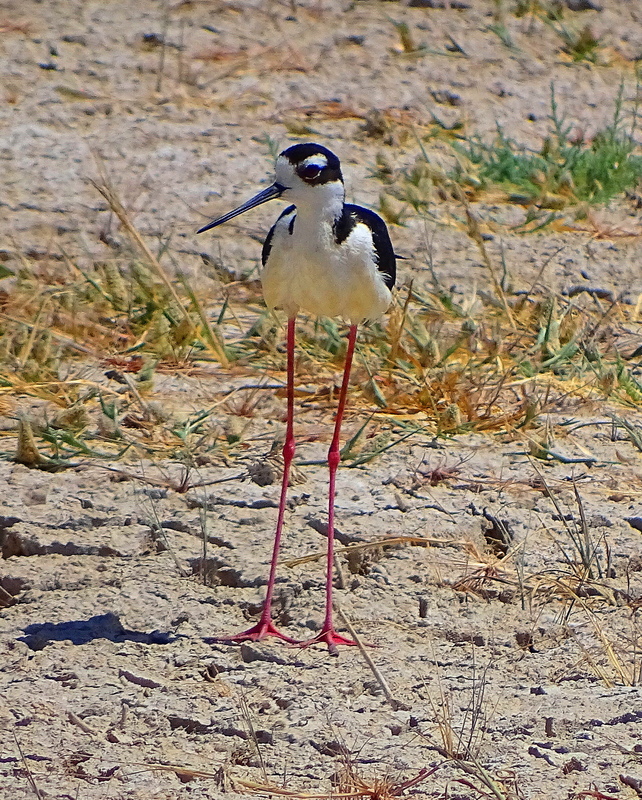 There’s something about Stilts, and I think I like them because of their long legs. The Salton Sea sounds a fascinating place. Fascinating is just the right word for The Salton Sea. It is beautiful, amazing, wildlife rich, desolate, creepy and toxic, all of these opposing things in one. I’ve never seen this type of bird. Their legs are long. They certainly are long cool birds in black dresses aren’t they! That is why women over history have adorned themselves with bird feathers to try and emulate their beauty. Gorgeous photos bely the sad news about the Salton Sea. Back in the late 70s, Mono Lake was close to becoming a dust bowl, and the two islands where 1/4 of California seagulls breed and nest were going to be accessible to predators. Perhaps its proximity to Yosemite helped its cause (LA water district funneled water out of the tributaries that fed the lake). Legislation finally passed to make Mono Lake a National monument (I belonged to Friends of Mono Lake for years). Perhaps something like this can happen for the Salton Sea. Seems to fit my Sunday Stills (fur and feathers) theme today! Yes Mono Lake has a very similar history and was almost lost to us. Northern California has far more effective environmental advocates than we do in in SoCal. The beauty in the desert is just as incredible as in NoCal, but very different, and harder for some people to penetrate. Mono Lake looks similar to The Salton Sea, minus the eerie ghost towns with people still living there, the fish and bird bones forming the sandy grit on the beaches, the sense of apocalypse slowly unfolding, with millions of birds watching and waiting. The Salton Sea seems like the most honest place to me, which is why I keep going back to it, decade after decade. I will post photos of the living ghost towns soon. I admire the people who live there immensely. Wow, Cindy, your words are heartfelt and beautiful in this comment. You definitely have the knack for the written word besides your incredible photography 🙂 The Eastern Sierra along the 395 is a wonderful place. We prefer to drive that route to enter the Tioga Pass of Yosemite. You are very kind Terri. Thank you. Yes the back road into Yosemite is our favorite too, and hiking in the Sierras around Mono & June Lake is a favorite summer activity. And Mammoth in ski season forever! I hadn’t read this quote, but I so completely resonate with it. It is not the beauty, or lack of it, where you are that matters, it is the beauty you find wherever you are. It is always there, waiting for you to find it. Imogen’s images are just so preternatural, so ahead of her time. She is so under-appreciated and so influential to so many more famous photographers (and paint artists) who emulated her. Thank you so much for this quote. It sends me happy to bed. Prop 68 was voted on today in Cali. If passed, it will direct funds to The Salton Sea. It is up to the voters to decide how much this matters. So, let’s hope it passes. The Salton Sea is such a fascinating region of California – I felt as if a dystopian novel had come alive here. These are lovely, Cindy – and you beat me to a BNS post that I have had in the pipeline… now spurred on to move it up the queue! I can’t wait to see it. I guess the BNS made it to Abaco too! Good for them. They need to spread out….. This is a beautiful area, I have driven through there several times, even at night it is an enjoyable drive. Cindy, I am going to reblog this article for you. Thank you for taking of your time to post such a beautiful post. Thank you more for your very kind response. I am glad you have taken the time to explore this area. It is one of my favorite places, and even after all these years, it has still not revealed itself fully to me. The desert remains forever mysterious. We are basically surrounded by beauty, more so in the most unlikely places. OMG, those legs! I have a new standard of measurement for models legs. The water problem sounds so terrible. If I could add my vote, I would. Yes, I know from your comment you would vote. Since we have limited power, your attitude is by far the best thing we can do. Those first two photos are like Monet paintings, with bird. Fabulous! I thought just that when I saw it. But it is a polluted, doomsday scenario. I know Monet would paint it so beautifully. True and Venice is the same now. I used to love Daddy Long Legs as a child with there silken slender legs. I see exactly what you mean. More pictures of beautiful birds from Cindy Knoke. These pictures were taken in the endangered area, the Salton Sea in California. Fabulous images of these cute birds, Cindy! There should be a plan to save these birds and wildlife everywhere else! Today Californians vote on Prop 68. If it passes, money will be diverted to help save The Salton Sea. I am seriously hoping it passes. Yes, to everything you said and such good news about 68. Fabulous photos and a fun easy nature lesson. This is a unique bird. It’s legs are like long, thin and red bamboo. Thanks, Cindy! Awwww, thank you so much! Thank for these great pictures, Cindy! I love their long red legs and gracious appearance. Love the colour of their legs, like they are wearing tights. I really wish humans would wake up and take care of this earth. So much is lost. We are in full accord. Good news though, proposition 68 just passed which will direct monies towards saving the sea. Very nicely captured! You are special my sister…hugs, and blessings! Hugs & blessings back to you Kendall! Stunning beauty. It’s been awhile; I’ve missed your blog, Cindy! Birds have such penetrating eyes. It seems they look directly into our souls. They always are looking at me when I first find them with my camera. It does feel like they can really KNOW you doesn’t it! Amazing birds, Cindy! The second photo looks like a Monet painting! I would love to see Monet’s interpretation of the sea. Legs! Just look at them!! They are sooo loooooooooong! 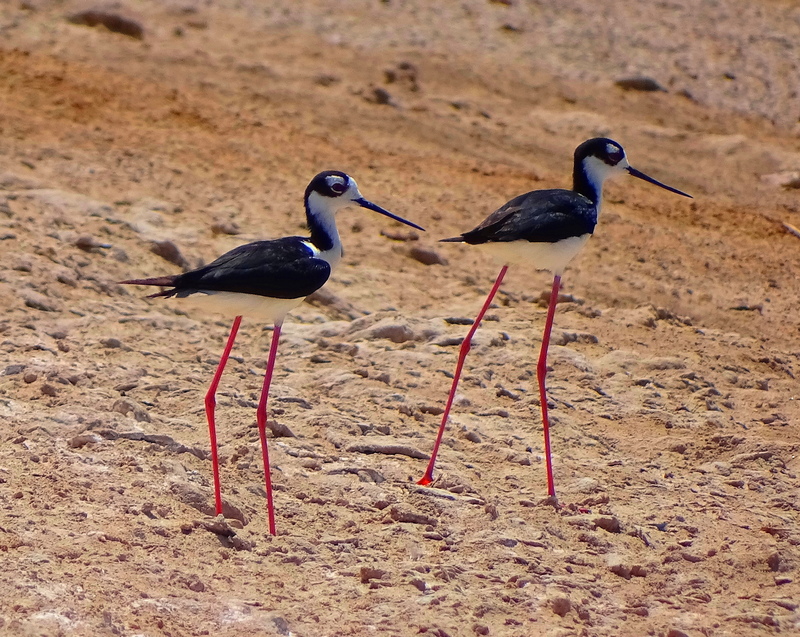 The stilts are amazing, and the story of this lake is heartbreaking. Your photos are amazing, too. The one at the very top of this post takes my breath away. I was able to travel with my hubby and on the way somewhere one restaurant stop – they sold donated books to collect funds for something – Of course I had to stop and look. I found a wonderful book dedicated to just sea birds. Thanks for stopping by Carrot Ranch and reading the offerings of the wonderful community of writers for Literary Art. Lucky you! The book sounds like a find. I miss the days of browsing in bookstores! What a beautiful place. I’ll have to add it to my dream bucket list. Please talk to me before you come. The Salton Sea is a blighted area. There is much beauty to be found, but one needs an insiders advice. Staying in Borrego Springs is a good bet as it is just beautiful, and I can give you tips for visiting the sea and nearby areas like Joshua Tree National Park.